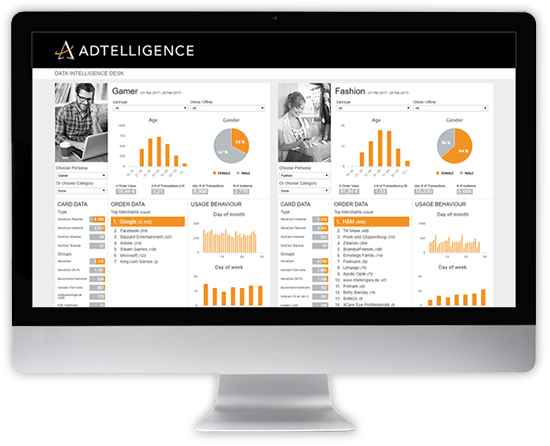 With Sales Intelligence you can adapt your sales campaigns to the needs of your customers and generate guaranteed more revenue for your existing customer sales. Automatically trigger the next best action for each individual customer to perfectly target your customers and maximize your sales success – at the right time, on the right device with the right message! Segment your customer data based on, payment data, credit card transactions, CRM or product data (PIM). Automated multidimensional classification of your customers into clusters and human-readable personas. Through the use of machine learning you can find signals in the data that are not accessible with manual rules. Evaluate the purchasing behavior of each customer group according to data such as age, gender, location, payment sizes, product group and products on dashboards that can be tailored to your needs. Use AI for omni channel personalization and send the right messages anytime and on any channel. With the right time to send and the right frequency to reach your customers, your campaigns will be continuously optimized. Automatically generate lead alerts for your customer advisors – reach customers who have viewed a product on the website but have not purchased it. No large projects, but a fast setup phase and a scalable and tailored overall solution. Measurable results in 3 months, not 3 years. Continuous optimization guarantees a high ROI. Fits perfectly into your infrastructure and enables the intelligent enhancement of your existing systems such as CRM, Email, Marketing Automation, Call Center or Mobile App.